If you are an experienced Business man, and you are a dedicated Christian who loves God's Word and has a heart for evangelizing Children through this unique Bible, I need your HELP! Check out our Store now to see our current picks on sale. * ICB 2-CD whole e-Bible regularly $69.90, now $34.94! * New paperback books, regularly $14.95, now $2.95 each, 10 or more, no limit. * Select e-Movies, regularly $5.95, now $2.95! * Select e-Books, regularly $9.95, now FREE ! An “e-Book” (electronic Book): Looks and reacts like a book. You are in control. An “e-Movie” (Electronic Movie or Video): Looks and reacts like a movie. Each one is about an hour in length with 4 to 6 minute chapter breaks. 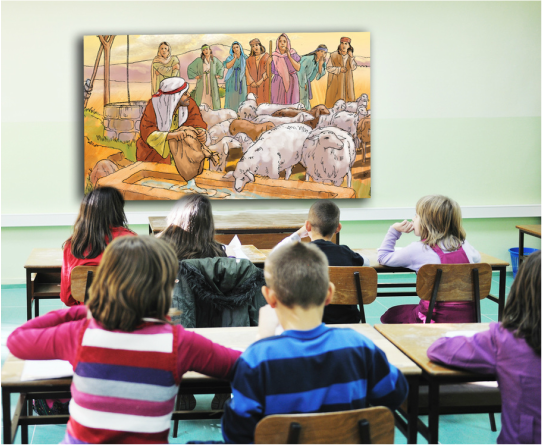 If you teach children the Bible in Sunday School, a Christian School, in a Home School or you have children in your life who you would like to see read the Bible on their own, we want to introduce you to an amazing Bible and Bible teaching resources.